Silverlight, WPF, Windows Phone 7 all from one codebase? Is it possible? Well, Colin Eberhardt gave us an hour worth of hints, tips and examples of how you can manage your XAML applications to fit these different software platforms. He’s an eager blogger, so his Colin Eberhardt’s blog has many more WPF and Silverlight tips. Please remember to post any feedback about the evening on twitter using our hashtag #SLUGUK, and thanks for all that came along on the night. Slides: Cross Platform XAML Applications – by Colin Eberhardt. With thanks to the cleanup crew that helped to put the EMC meeting rooms back in order — Paul Stancer, Paul Lo, Mike Taulty (whom selflessly put chair-shifting duty before worrying about catching a train back to Manchester! ), plus EMC Consulting for providing venue and beers. Ordnance Survey getamap – I made this! Well, the title is correct in one way – for over a year, I have been the principal design authority on the technical vision and delivery of this new and exciting way to explore Ordnance Survey maps. I won’t by any means deny the fact that I was only one of a small team of talented and enthusiastic people that made the application a reality (acknowledgements are at the bottom of this post) but I’ve been working on this project since its inception and because it features two subjects that I’m quite passionate about (Silverlight and mapping) I feel that it’s something to stand up and be proud of! Ordnance Survey (OS) is the national mapping agency of Great Britain. It is their job to collect, maintain and distribute the most accurate and up-to-date geographic information of the whole country to government, businesses and individuals alike. As a Trading Fund of the UK Government, Ordnance Survey generates revenue through the licensing of intellectual property rights in the data under Crown Copyright. This is done directly with customers or via more than 500 private-sector partners thus investing heavily in attracting more partners to deliver customer-led solutions to meet market demand. Since 2010, the Ordnance Survey has also provided free and unrestricted access to a range of mapping imagery and geographic information as part of the “Making Public Data Public” and “Smarter Government” initiatives. As a government trading body it provides accurate and up-to-date geographic data to government, business and individuals alike. Ordnance Survey gathers, collates and publishes mapping data in a variety of formats (paper maps, digital imagery and various data collections) often with Crown Copyright. Mention Ordnance Survey (OS) to the average person on the street and the majority will immediately think of outdoor walking maps. In my opinion, the Ordnance Survey the Landranger 50k and Explorer 25k leisure maps are two of the most recognisable map styles in the UK, due to their level of detail, coloration and affectionately regarded as “works of art rather than maps”. Well, Ordnance Survey had made these maps available through “OSExplore” for a number of years, however the web experience and collaborative elements of that system was a smidgeon of the functionality that is expected from today’s websites. So, that’s where my team from EMC Consulting stepped in, to help Ordnance Survey rebrand, design, develop and deliver a compelling modern experience to navigating Great Britain showcasing their latest mapping style, called “ZoomMap” (opposite) and overlaying other contextual data such as points-of-interest, routes, news snippets, weather and collaborative sharing. The aim was to provide a consumer experience wherein the most intrepid explorer through to the casual weekend walker could discover much more about an area of interest rather than just studying a map or book. Traditionally the people that sought after an Ordnance Survey map were hikers, but times have moved on from that an Ordnance Survey fully recognised that hikers, bikers, campers, horse riders, joggers, people on boats all can find a use for getamap. Thus by absorbing data from a number of external sources (many of which are recognised partners) the getamap application becomes an authoritative hub of information rather than having to fish about in a number of maps, books or websites! So, in the first week of April, we published the getamap application to the live website, initially migrating those loyal OSExplore users first and taking our first subscription payments for the service. Let me give you a run though of the functionality of the getamap application and how it evolves map planning to a new level. 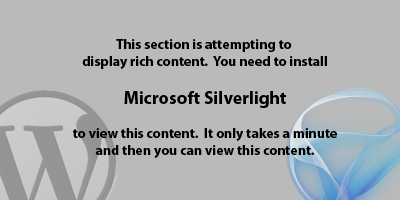 The application uses Microsoft Silverlight technology to present this mapping experience, so if you don’t have it already installed, you’ll be whisked away to a the Microsoft Silverlight download page to install Microsoft Silverlight first. Otherwise, the application will download and you’ll be presented with the login panel. There is guest access if you don’t want to register to the site but this will mean that you won’t be able to access all the functionality on offer – the rest of this walkthrough assumes that you have signed in as a registered user. Once that login panel has gone away, you’ll be able to see the full mapping area and ready to explore Great Britain. Our primary aim with the available screen space was to expose as much of the map as we possibly could, yet provide active panels that can help supplement the map view with relevant information such as routing information, things to do, places to stay, news, weather and of course a bit of advertising from Ordnance Survey or partners. Our user experience guys spent quite a bit of time trying to differentiate the getamap application from its closest competitors yet our constant struggle was ensuring the correct balance of intuitiveness versus functionality. Many of our early user testers found the various functions easy to discover but just in case some are overlooked, below is an annotated view of the application and its main functionality hotspots! 1. Location search – type a place name or postcode for the most logical way of searching for a location within Great Britain, however National Grid references (eg: NY 340120) or Lat/Long coordinates (eg: 54.05, -1.30) can be specified too. If that’s still not enough, then click “Advanced Search” for even more options! 2. Map navigation controls – zoom in/out and scroll about the map using these controls. ZoomMap is the brand new styling we’re showcasing in getamap for Ordnance Survey. We’ve exclusively launched with this style which is so much clearer than the super detailed OS Explorer and Landranger 50kstyles. Aerialimagery is available courtesy of the Microsoft Bing Maps Aerial data set and available at all zoom levels in step with ZoomMap. Leisure is the most familiar Ordnance Survey view since this comprises of only the OS Landranger (50k scale) and OS Explorer (25k scale) mapping styles that are available as paper maps or as regularly used in publications. Since we wanted to keep a reasonably high quality image for these two scales, the map zoom level is bounded when this mode is selected. 4. National Grid reference status bar – whenever the map settles down, we work out the National Grid reference at the centre of the map to give the more seasoned adventurer a more familiar notation. 5. Links to manage your getamap account or find out more information about the benefits of registering/subscribing. 6. Our tab options to have a look at the Ordnance Survey magazine or the Ordnance Survey shop. 8. The mapping area! – Displays all your plotted items and pinned points-of-interest on the map with interactive callouts for each item. 9. “On my map” panel – Displays a list of all the items that you’ve plotted on the map so far; be it your routes or waypoints or points-of-interest that you’ve pinned to the map for later. 10. “Things to do” panel – Think of this as a dynamic directory listing of points-of-interest or routes. Information about historic venues, parks, hotels, B&B’s, pubs, national walks etc are indexed and searched within the context of the area of Great Britain you are looking at. Our directory consists of data aggregated from a number of sources such as Visit Britain, Enjoy England, English Heritage, the Good Pub Guide, Specialized and many more. 11. “Get driving directions” panel – Although our default route plotting is completely freestyle, driving directions help you figure out how to get there in the first place! We use Microsoft Bing Maps’ routing services to figure out and show you the easiest options of getting from A-to-B by road. 12. “Weather” panel – Selecting this option displays the weather forecast, now and for the next few days for the area currently in view (or the nearest weather station). Information is directly sourced from the Met Office. 13. “News” panel – Displays news items sourced by Moreover who aggregate geotagged news items from a variety of professional news agencies, official blogs, feeds, and websites of reliable note. This information is presented in getamap within the context of the viewable area of the map. 14. “Featured brands” panel – Information panel displaying all the partners of the Ordnance Survey getamap site and navigational links to either further background information or to their own particular directory area on the “things to do” panel. 15. “Handheld devices” panel – Through the use of Garmin’s own device API, we’ve been able to hook into a connected Garmin GPS device and interact with the data on it. That means that you can view, import and export tracks or routes with getamap! 16. Button to how/hide the discovery (left hand side) and summary (bottom) panels. (Only available if a subscriber). 17. Summary panel – This bottom panel switches context dependant on your interaction with the map. Normally this panel will display advertisements to promote other Ordnance Survey or partner information; or when in route plotting mode, will display route summary information such as the duration, elevation profile, sharing and display options. 18. Dynamic map scale and map copyright notices for the displayed map imagery. As you can see so far, the functionality of getamap far surpasses any of the basic mapping applications on the web. It is recommended that you give it a go yourself and visit each one of those 18 points! But here is the coup; for the launch of getamap, we worked hard with Ordnance Survey to prepare the release of their new VectorMap style maps for which no other partner has access to a production copy (for the time being) for use on a public website. In fact most other websites have to resign themselves to using the existing Explorer, Landranger, Miniscale and MasterMap products. Our VectorMap display is available under the guise of “ZoomMap” and is the default view. ZoomMap mode is a much clearer, uncluttered view of the selected topology and is consistently the same pastel pallet of colours, typography and “asset density” throughout the various zooms from national to regional to district to street level. The image below gives you an example. Most likely, you’ve spent the first 5 minutes of exploring getamap by locating your hometown and panning about the map, exploring the map imagery available but as I’ve alluded to above, there is so much more. Let me elaborate with the main mapping toolbar (point 7) since this is the main starting point in personalising your map (once you become a registered user). Hover any of the buttons to reveal a tooltip if you are not sure. The 4 buttons in the “Tools” area allow you to plot your own points-of-interest or plot a route. If you make a mistake, then there is a point eraser which will rub out any markers you set down. Creating routes could not be simpler though, by clicking the points in succession over the map as you explore or by clicking a point on the route itself to add an interim marker. I’m sure you’ll get the hang of it quickly! There is one timesaving trick though; that first button in the “Tools” section performs the ability to import an existing route from GPX/KML files which are commonly used in other mapping applications or from GPS devices (such as the Garmin range). This allows you to accurately render your route immediately, then save it as part of your map. When any kind of item is plotted/pinned on the map it will have a corresponding entry in the “On my map” section in the left hand panel. Think of it as a manifest of your map items, which you can control just in the same way as using the toolbar to remove or the navigation controls to jump to that item, so even if an item disappears from view, the “On my map” will always be a way of keeping track of what you want as shown below. Another special feature that we incorporated into route plotting, was to determine a raft of statistics and calculations as you go. In both the previous and next screenshots there are routes plotted on the map, thus as you plot we calculate the position of each waypoint/marker (in both lat/long and national grid notations), the elevation profile, distances between waypoints and the time taken using Naismith’s rule. These dynamic calculations are one of the distinguishing features of getamap to its other competitors when you consider route planning for serious outdoor enthusiasts. Routes can have additional information added to them on each waypoint put on the map – add a comment or a photo for a reminder or to specifically point out that “left turn” that everyone seems to walk past. They’ll be added to your print outs too which makes it ideal for group outings, charity events geocaching or treasure hunts! Of course, the weather is primary consideration once you’ve donned your boots and jacket and ready to set out on your route. Thus Ordnance Survey teamed up with the Met Office to provide regional weather reports for the local area viewed over the next days ahead. You can see the detail in the image below or give it a go yourself, just be wary that getamap will check to see if there are any new weather stations in the area that you can see on screen, so that the Met Office data is the most relevant information available. If you haven’t already spotted the old style floppy disk icon on the main toolbar, then this is where you can save your map for future reference. This is only available to registered users but you won’t lose your work each time you leave the website (we prompt you to save if you try goodbye). We save your maps to your own private area on our server but we do need you to give it a name so you have some idea what is on it! There is also the opportunity to categorise your map – there are a couple of defaults always specified, but you can add your own too. Categorising your maps is entirely optional, it just allows you to sort through your maps as the build up in number over time. The “Maps” buttons on the main toolbar allow you reset the map to a blank canvas (don’t worry you’ll get the opportunity to save it if you’ve unsaved changes) or to load in a previously saved map from the “map folder”. As seen in the screenshot below, the “map folder” has two tab view, wherein all the maps that you create are private to you and can be found in the “my maps” tab. The “purchased maps” tab has a similar view but displays information about the maps and reports that have been bought as a registered user or a subscriber through the Ordnance Survey shop. It’s one thing to look at those gorgeous OS Landranger and OS Explorer maps and decipher the icons and explore the landscape but we decided early on to supplement getamap with a directory listing of other points-of-interest that will help you plan that perfect trek or getaway break. So Ordnance Survey talked to a number of other outdoor leisure partners (a small selection are: Visit Britain, English Heritage, National Trust plus the Good Pub Guide for those thirsty explorers amongst us) to compile that authoritative listing. You can see the results of our labour (we did a lot of data cleansing and verification to ensure accuracy) by opening the “Things to do” panel on the left hand side. Searching is limited to the area viewed so that you are not necessarily swamped with information if you pick an area with a large number of point-of-interest (try looking up pubs in Westminster for example!). We limit the results on both the list view and the map. Give it a go, zoom in and out (be kind and do it slowly), click some of the pins on the map to display some summary information about them. If you want to remember that point-of-interest, pin it by clicking the pin button against it’s name in the “Things to do” panel which will also add it into the “On my map” panel I mentioned earlier. The “Find things to do” panel does not just list points-of-interest; it is also home to shared routes too. There are a number of authored routes from the AA and magazine publications such as Trail or Country Walking, which can be displayed on the map to check out its details and then available to buy as a booklet with detailed instructions and route on a Ordnance Survey map – just as if you were to read it from a book. Routes can be shared amongst the getamap community too which is a fantastic feature, especially if you’re organising an event or proud of a particular achievement – and it’s easy, when your route is selected, look at the bottom panel and click either “Route is Public” or “Route is Private” on the “Route Settings” tab. If any route is made private it will also show in the “Find things to do” panel under the “Public routes” category (remember that the search is contextual, so you have to be looking in the area of the route for it to show in the listing). Of course, you can spend hours plotting and pinning as you explore Great Britain in getamap, (we would love that very much!) but you’ll want to take this rich information along with you when you step outdoors – that means you’ll want to print the map. So, gone are the days where you had to search the shops endlessly for a set of overlapping maps (although the proper concertina maps are high quality prints). The printing facility in getamap is extremely flexible enabling you to print the areas you are actually interested in and if your route is an awkward or long trail, you can carry on selecting and printing as much as you like. Printing is free for lower quality, A5 sized prints across all types of prints (ZoomMap, Leisure or Aerial). If you want to print a map to A4 and with a higher quality then you’ll have to part with some cash because it will be an OS Explorer or OS Landranger style map (well, there is a Crown Copyright. to consider!). I won’t go into details as to what is more cost effective because prices change, but basically if you are registered user there is a fee per print but as a subscriber it is an one off annual fee. Clicking the print button pops up the dialog below, which will hopefully explain the appropriate charge for acquiring these custom prints. I’ll skip the free prints because you can have a look at that yourself at no charge. If you opted for a full page print the map mode will switch into either the OS Landranger 50k or the OS Explorer 25k imagery depending on the level of zoom. In fact we restricted the zoom to these particular products. The area which is not masked is the area you will print. Switch again between OS Landranger, OS Explorer or print-to-fit and the application will automatically recalculate the printable area so that you can appreciate the effect the map scale has on your final print. All of the points-of-interest and routes that are within the printing boundary will be printed too! If at any point you need to make a payment, you’ll be whisked off to the Ordnance Survey shop (which was not part of my teams’ work). There you can pay for prints, authored route information or any other Ordnance Survey catalogue item in one go. It’s well worth taking a look at a getamap subscription if you think you’ll be using the application a fair bit. If you are waiting for the payment of the print to be processed, you’ll find them popping up in the “Purchased Maps” tab of the “Saved maps area” as mentioned earlier in this post. Finally, I’ll pay heed to a specific bit of functionality that I think really sets getamap apart from other mapping websites. Previously, I hinted that the main toolbar and “On my map” panels allow GPX or KML files to be imported or exported from getamap. Well we went a bit further in that there is an option at the bottom of the left hand panel called “My handheld devices”. If you are in possession of a Garmin GPS device, plug it into your laptop and getamap will connect to the Garmin device* and allow you to import or export from the device’s memory! So you can export a route from getamap, do your walk/cycle/whatever, then import the track from the device into getamap, check out the elevation profile and distances, add some photos and maybe share it amongst the getamap community – get the picture?!! * First off you’ll need the appropriate software that Garmin provided with your device. For this reason, Garmin were the only manufacturer ready at launch with the suitable software to do this. Hopefully there’ll be more added to this list in the future. Principally we settled on Microsoft Silverlight as the primary delivery mechanism; mainly because its ability to create smooth, interactive, performance driven experiences across a wide range of browsers and operating systems. At the time of development, HTML5 was not even born yet and Silverlight consistently out performs HTML in the world of pinning/plotting items onto interactive maps. Within the Silverlight application we use the Microsoft Bing Maps platform to help display our imagery (with some degree of coercion) as well as to provide us with supplemental services such as Aerial imagery, location search (name and postcodes) and road routing. The Silverlight application communicates with a number of services, hosted by Ordnance Survey or partners (eg: Microsoft, Met Office, Moreover). I feel that this project has managed to use nearly every form of communicating out of the browser since we’ve used WCF/SOAP and RESTful services in either XML or JSON formats over both secured and unsecured transport! On our backend, we use SQL Server 2008 R2 because of its improved spatial indexing capabilities. SQL Server also provides the infrastructure for our processes that import and cleanse our partners’ point-of-interest data. That’s probably as much as I’ll say. Mark Mann (hey, that’s me) Gary Foley, Jon Sharratt, Jo Lacy, Peter Hay, Paul Shang, John Hunnisett, Nik Rolfe, John Shiangoli, Haro Lee, Felix Corke, Einav Avni, Ed Mitchell-Innes, Richard Wand, Simon Munro, Simon Rigby, Rory Street, Owain Wragg, Tim James, Rob Henry and Nicholas Beswick. All screenshots, imagery and logos used within this blogpost remain the copyright of their respective sources and are used here merely for promotional intent.